Physics Department, University of Surrey, U.K.
based on a talk given to the Swedenborg Scientific Association, 20 April 2002. It is particularly valuable to discuss questions concerning quantum physics and spirituality together, in order to see the connection between them from the New Church standpoint. There is an urgent reason for discussing this link, because there are people who want to identify these things. There is a widespread feeling that somehow that they are connected, but some ‘new age’ people want to say that quantum physics tells us about spirituality. We know from Swedenborg that the connection is not quite so simple, so we need to understand in more detail what is going on. To review where quantum physics comes in, I will remind those of you who have taken physics courses in which quantum physics has been introduced, of some of the problems we have. One of the problems is that the particles discovered in modern physics are not just little lumps that travel around, but behave as waves. The electrons, which we think of as a prime example of a little particle, can be scattered with interference patterns: diffracted through slits, around corners, or from crystals. They can be reflected as a wave. Furthermore, these waves are probability waves, so we do not say that an electron is definitely in one place, but that it has or is a distribution of probabilities. The form of this distribution can be worked out accurately in quantum physics, which makes very precise predictions. But only the probabilities are predicted: physics does not tell us exactly where the particle is. This is one of the puzzles: to understand why and how particles behave as waves. The other side of the coin is that waves, light waves for example, in which colours are described by wavelengths of oscillations, behave like particles. This is the way that quantum physics started. Max Planck, just over 100 years ago, showed that he could solve some of the fundamental problems in physics by assuming that light waves were not just smooth oscillating waves as Faraday, Maxwell and others had thought, but came in lumps of energy which he called quanta. The word ‘quanta’ comes from ‘counting’. Small particles in nature are not little solid bodies or corpuscles with rigid edges, the way Newton, Boyle and Locke thought in the 17th century. They are more like clouds of tendencies or propensities. The shape of these clouds is worked out very accurately in quantum mechanics (this shape is what the wave function describes), but they do not just stay dispersed like clouds because they still somehow maintain a unity. So we need a systematic account of how these spread out clouds or fields can yet only act in a single unified way to give one outcome. This selection problem is the measurement problem that quantum physics has tried to solve over the years: to understand how things that are spread out, and behave like waves while they are spread out, can then act only in a single manner with a single response. The combination of these two problems that appear in quantum physics is called the problem of wave-particle duality. The task that quantum physicists now have is to try to understand the connection between those two features of quantum physics. I am not going to explain much more about the physics details, but will return to some of these things in a general way below. We need to ask what is really going on in nature: what is quantum physics telling us? The way I want to try to answer this question, is by using some ideas of Swedenborg. This is not the way I normally introduce quantum physics, but I am relying on the fact that you may well have some of these ideas already. My basic goal is to draw some correspondences between spirituality and quantum physics: not identity, but correspondences. Thus, those of you who know Swedenborg can use these correspondences to understand quantum physics, and those who know quantum physics can see the reverse connections as well. These spread-out waves, I will suggest below, correspond to us before we decide what to do. Imagine that we are thinking of doing different things. In our minds we entertain possibilities. That is the function of our understanding: is to think about things before we do them. We ‘entertain’ or consider possibilities – so the wave pattern in physics is ‘like’ us when we are entertaining multiple probabilities. Thus, there is something that ‘corresponds’ between waves and understanding. Furthermore, the physical situation is more like us thinking, rather than an already completed result. Originally, physicists thought that all electrons and atoms were in very precise positions: that is, as if we had already made up our minds what to do. But we know from Swedenborg that we only get a precise outcome at the end of process that involves intention, and understanding, then deciding to act in some way in the natural (DLW 214). I will expand in more detail below, but what I want to show is that these features of quantum physics correspond to processes in our minds. There is a connection of correspondence, as we might naturally expect after Swedenborg. This last paragraph is a preview of the remaining part of this talk. Maybe you don’t understand it now, but I want to give a few ideas to help as I proceed. One big problem in physics is that the wave functions that are spread out have a shape which satisfies well-known equations, but it is still not clear, as I said, when and how physics gets just one actual outcome. The electron may have a wave function spread out over the whole room, for example, but if you have detectors in the room, only one of them, at random, will detect the electron. In quantum physics, we do not have a good reason why an electron can only be found in one detector and not somehow in all of them. So there has been a lot of discussion in the past 70 years of how in physics the standard theory with waves just leads to one outcome. This has given rise to very many alternative ideas, and these are listed in Figure 1. Those of you that have read some popular physics will recognise some of these alternatives, and they are all designed to answer the same measurement problem. The first suggestion is called Everett’s many-worlds interpretation, in which there is not any real selection, but all alternatives occur the same time, for example in some set of parallel universes. The second theory of ‘decoherence’ says that it really like that, but that it appears to a good approximation as if only one outcome occurs. Niels Bohr thought it was the fact that experimental apparatus was ‘classical’, with no wave behaviour, that gives rise to a particular outcome. We now know that quantum physics applies to the experimental apparatus as well, so that does not really solve the problem. Werner Heisenberg, Eugene Wigner and Henry Stapp have in turn introduced the speculation that selection is something to do with consciousness or mind, and this has given rise to a whole stream of suggestions in which consciousness (or something) has become more and more involved in trying to solve the problem of quantum physics. Wigner in a paper of 40 years ago suggested that it was the consciousness of the observing scientist, and this idea has been carried on by Stapp, who says that consciousness is actually involved in the brain. Stapp believes that since a quantum brain has many alternate things that can happen, consciousness selects one of these outcomes to produce a result. I have listed other alternatives here, which get progressively more ‘way out’. A few of these ideas we can imagine being true, for example that ‘spirit produces nature’, but some people have gone even further than that, and have said that nature is somehow essentially spiritual – that it is connected with, or equal to, the spiritual. Others have continued this theme to say that quantum physics is a way of learning about spirituality, a way to regain our spirituality. There is a great range of possible solutions here that try to solve the same problem: how something that is described by a wave can produce a definite outcome. The trouble starts from the fact that when physicists think about nature, they only have two ideas in mind: they can think of a wave or a particle7. The difficulty is that the objects which quantum physics tells us are in nature are not just waves, and not just particles, so the challenge is to find a new understanding and a new picture. As well as the more extreme ideas above, there are further ideas that have been proposed. James Jeans, the mathematical physicist, wrote8 about 60 years ago that “the wave function looks like not something solid and substantial, but looks more like an ‘idea’”. Some (e.g. Zohar9) have taken this to mean that quantum physics tells us about ideas. Others, discussing the putative identity of spirit and nature, have tried to work out various ways for why they appear to be different. They have said that perhaps spirit and nature are different grades of energies, different frequencies, different dimensions, and/or different ‘fineness’ of material. Those of us with backgrounds from Swedenborg will recognise that suggesting ‘different dimensions’ here is trying to use spatial analogies (thinking from ideas of space) to distinguish mind from nature. When people try to talk about ‘different frequencies’, they are using temporal analogies to think about this difference. But we know from Swedenborg that we cannot really use either of these kinds of analogies (TCR 30). From Swedenborg we think we know which of all the above ideas make sense, that is, which of them could possibly be true. Let us point out which ones these might be, before discussing which ones are true. We know that choosing to do one particular thing cannot be just an illusion, because otherwise it would make a mockery of trying to order one’s life. We know that particular outcomes are chosen, so that it cannot really just be a good approximation that selections do occur. We know that consciousness is perhaps involved. It is not ruled out, because we know from Swedenborg that spirit produces nature, and it may be that consciousness, as part of spirit, is involved. But we know that the last three ideas (9-11) cannot be true, because we know that there is an essential difference between nature and spirit, which means that we have to find a different kind of connection between quantum physics and spirituality, that is not just identity. There must be another kind of connection. Of the next set of ideas, we know that distinctions based on time or dimensions cannot be true. We know that the true distinction is not based on ‘fineness’ or ‘subtlety’: Swedenborg has comments to make about that (HH 38, TCR 280). It may be true that the wave function looks like an idea, but that is only true if we take the word ‘like’ to refer to correspondence rather than to be just equal. All of the above is a very brief and necessarily cursory introduction to how we can use Swedenborg to understand modern physics. I am going to discuss the existence of ‘multiple generative levels’ or ‘discrete levels’. Swedenborg makes a great effort to distinguish discrete from continuous levels (HH 38, DLW 184ff), and what I want to show is that there are discrete levels within the natural, that is, within quantum physics. This will help us to understand what is going on in physics. Furthermore, these discrete levels within the natural will correspond to other discrete levels we know about within spiritual processes. Thus, we have this triadic structure within the natural, as well as within the spiritual, and these are linked together by correspondences. This is the overall theme for what follows. If we recapitulate what Swedenborg tells us about how spirit and nature are combined, and if we look at what Swedenborg said after he was told what was actually happening rather than what he tried to guess at in his earlier years, which is quite different, then we see that he later in his life learned that the spirit is an essential means in the creation of nature. Nature is not created immediately from the Infinite, but is created by means of the spirit. He came to see that the natural world is a final effect of causes working in the spiritual world, which themselves manifest certain forms of love. So, as a consequence, this pattern of love > wisdom > effect is the pattern that we can try to use to understand what is happening in quantum physics. This pattern can be summarised in many ways: love > wisdom > effect; or soul > mind > body, as the same triadic pattern. Swedenborg gives us ample reason to show that this is repeated in the soul: we have celestial, spiritual and spiritual-natural. It is repeated in the mind: we have an interior rational, an exterior natural, and a sensory mind. So the question is, it is also repeated in the natural world? This is where he talks about three degrees in nature. These days, we don’t believe in ‘ether’, but the question is whether we can interpret what he says about purer, middle, and ultimate ethers in such a way that makes sense. I am going to assume that these three adjectives refer to different kinds of ethers. He might not have known from the scientific point of view what they were, but they certainly appear to be three different things, and certainly not three different vacuums12. But do we recognise this pattern? Does it make sense to us? We have to allow some flexibility in the interpretation of what he meant by ether, but he does tell us what are the functions of these three ethers. He tells us that the first one is to do with gravity, the middle one is to do with magnetism, and the final one is to do with material things. Do those descriptions make sense? Let us try and work out what three degrees in the natural might be, if we use New Church principles to work out a priori what those degrees might be expected to consist of. From the correspondences of the natural with the three degrees in the spiritual, then in the natural there must be (a) a way of receiving in the body the intentions of the spirit, furthermore there must be (b) a propagation of causes within the natural, and there must be (c) a way of producing effects in the natural. We can think of these as ends, cause, and effects, all in the natural. This is what we expect to see from Swedenborg’s point of view. Is there a way of looking at the natural that we know about from science, in which we see these three degrees? In modern physics we do not know anything about ends; in fact we deliberately refuse to consider ends in physics, as a rule. But we know a great deal about the propagation of causes in physics: that is what physics does extremely well. It tells us how causes propagate through sequences and the various changes produced. And in physics we know some little about effects. In fact, the irony is that the whole business I talked about earlier, of getting a definite outcome in quantum physics, is precisely because physics does not know enough about the actual effects. So it is clear that contemporary physics knows a lot about propagation of causes, and it knows almost everything about the production of effects, though there is still something missing from what quantum physics tells about the final effects. Thus, if Swedenborg has any light to cast on what these three degrees are, it should help fill in an important lacuna, a noticeable gap in quantum physics, which is the production of effects. If we look at physics, and at what physics regards as part of its central understanding, the important idea in physics is energy. Energy is the theme that goes through contemporary physics. It talks about potential energy, and about kinetic energy: kinetic energy is energy to do with motion, and potential energy is to do with what would happen if the circumstances were right. In classical physics we can go a long way by knowing about conservation of energy (as well as conservation of momentum, angular momentum etc). Energy in quantum physics, the total of the kinetic and potential energies, is converted into what is called the Hamiltonian operator (normally abbreviated H). I will just say that this operator enters into the Schrödinger wave equation, which governs all quantum wave forms. It thus generates all fields of probabilities, and hence all time evolution. All of the dynamics in quantum physics is specified by knowing what the initial state is, and what the Hamiltonian operator is. So, energy in some form is very important in both classical and quantum physics. Here, the Hamiltonian H is an operator acting on the wave function which tells us how the wave function changes, by means of the derivative of the wave function with respect to time on the right hand side of the equation. In this way, the Hamiltonian determines all the dynamics, as we can solve this equation to find the wave function at all places x and times t into the future. The central equation in quantum physics is an equation of this form (perhaps the Schrödinger or the Dirac equation), which always has a time derivative which tells how the wave function varies with time. Furthermore, once we have this wave function, we can find probabilities by taking its square modulus |Y(x,t)|2. The question is now, do we see a triad of end > cause > effect in this structure? I have just described the structure of quantum physics as every atomic physicist, every nuclear physicist practices it. Do we see the triad there? I claim that we do, if we look properly. I claim that that there are three things. To help you understand, at the bottom of Figure 2, I have drawn the correspondences to what they are in the mind. Those of you that know quantum physics can look up at the top, and those that know Swedenborg can look at the bottom, and then I want to make a connection between these. If you know one, these connections will help you understand the other. Thus, looking again at quantum physics, we have the Hamiltonian which is to do with total energy, which is somehow active, since it is an operator which operates on the wave function and changes it. The Schrödinger equation is the rule for how the Hamiltonian operator produces what we can call the ‘tendency wave’: a wave function which is a form of propensities or tendencies for action: a probability wave. Then this wave function (in fact its squared modulus) gives a probability for different outcomes. This is the structure of quantum physics, and in this structure we now see the same kind of structure of triadic degrees that we have in our minds. At the bottom of Figure 2 is a very simple triad from psychology. If we look just in our external mind, then we have intention, thinking about plans, both leading to action. This is the corresponding triad to the processes in quantum physics (of course, not the same triad). From Swedenborg we know about love > wisdom > use (or affection > understanding > decision, or celestial > spiritual > natural) and we have in general correspondences to all these triads. We know that the same pattern repeats itself in the whole, and in each part. I am talking about every single process for every single particle in quantum physics: every time any smallest thing evolves in time, we see the same triadic pattern. We see that there is a correspondence between energy and intention. It is very popular these days to use energy in a very general way to refer to all of intentions in our mind and in our spirit: we talk about mental energy, and about spiritual energy. Many people confuse these: they conflate spiritual energy with physical energy, saying that these are just different kinds of energies. Here we can see that they correspond to each other. Swedenborg would use ‘heat’ and ‘light’ (DLW 5), and I think that the word ‘energy’ is a good general interpretation of the meaning of ‘heat’ or calor. In the top middle we have waves or field structures, where Swedenborg refers to light, but these waves are waves of energy, that are spreading out and trying to do something. We know that light is a form of energy, while Swedenborg says ‘wisdom is the form of love’ (AE 1170), or ‘intentions take form in the understanding’. There are many similarities in the logical structure of the sentences which connect these first two degrees. For those of you who wonder how quantum physics differs from physics that we know, I will just give a brief demonstration of how this makes a difference. Imagine someone roller-skating in a hollow. In classical physics there is a limit, not unexpectedly called the ‘classical turning point’, at which the kinetic energy runs out, as energy has all turned into potential energy. In quantum theory, by contrast, there is no sharp limit, since everything is based on tendencies, and is not just predetermined and rigid. If this were an electron in an atom, then it appears with a small probability even in what is called the ‘classically forbidden region’. This is extremely important in quantum physics, and gives rise to what in my mind is interesting about quantum processes. It is essential to understanding things such as transistors, where electrons tunnel through very thin layers, because if you have another dip on the right hand side then they can get through. The same thing appears with radioactive decay, because the proton or alpha particle inside a big nucleus has a big barrier which stops it getting out, but it can still tunnel out with a very small probability and therefore you get a very long lifetime, such as thousands of millions of years, but it still gets out eventually. That is one of the differences between classical and quantum physics, because there are tendencies and not just hard and fast limits. The fact of having tendencies is related to what Swedenborg tells us concerning intentions, or conatus, that produce the results without having a fixed connection between them. What I have given so far is a brief summary of the correspondence between energy and waves of quantum physics, and intention and thoughts or understanding in the mind. We should really draw the mind above the physical degree, so intention, understanding and effects produce, and correspond to, energy and wave forms. In quantum physics, the starting Hamiltonian is composed of kinetic and potential energy. Now the question is, where does the Hamiltonian come from? I’m going to try and describe what is called quantum field theory. You may not follow the details, but it is important to my argument that physics has discovered more of what, so to speak, is ‘behind’ the Hamiltonian. When quantum physics started 70 years ago, physicists had to invent the Hamiltonian. There were various clues and tricks, and if the results came out right you knew that you were successful. But, in reality, there is some physics behind that. We now know that the potential energy part of the Hamiltonian is not just arbitrary, but comes about from what are called virtual processes. We know that the electromagnetic forces between two charged particles are not just given by Maxwell’s equations, but are given by ‘virtual photons’ or ‘gamma rays’ that are exchanged. 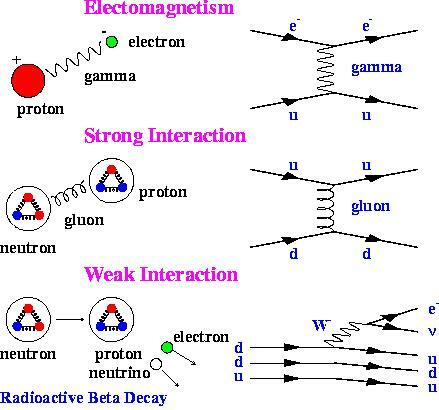 The nuclear attraction between two protons, or between a proton and a neutron is not just arbitrary, but is given by the exchange of quarks and gluons. Quarks are attracted to each other by exchanging gluons. So there is something going on ‘behind the scenes’ of what I have described so far, which produces the Hamiltonian. What are these events? Furthermore, the kinetic energy, which is to do with mass, is said by physicists to be ‘dressed’ by virtual processes. This means, for example, that a bare electron has a cloud of photons that go along with it, because it is continually emitting and receiving photons, and these photons contribute mass via their energy of their own. So even the mass and the kinetic energy are not things that are given immediately, but are also produced from behind the scenes, and appear in the Hamiltonian which contains kinetic and potential energy together. I will just mention what some of these virtual processes are, as pictured in Figure 3. This is physics that has been discovered in the last 50 years: that the electromagnetic interaction between charged particles is by exchange of photons; the nuclear forces between protons and neutrons is by exchange of a gluon; the weak interaction is by exchange of ‘heavy vector mesons’ called the Z and W particles. In physics we say that there are four kinds of interactions altogether. There are these three here: electromagnetism, nuclear and weak forces; and the fourth one is gravity. So far I have not said much about gravity, but will come back to that later. The point I want to make is that all of these things are going on behind the scenes, and physicists say that these are virtual particles. They are not actually happening, but sort of ‘virtually’ happening. Then there is a challenge to us to understand what on earth is going on? The way I want you to think about it, is that these virtual processes are the means by which plans are produced. Remember I said that we have intention, understand and effects. The understanding has all these plans, but the question is: how are these plans worked out? There must be something to help these be worked out. From Swedenborg we know that all the thoughts to do with this working out come from prior levels (AC 6200). We know that the influx from the heavens is essential for us to even think, to even get our understanding working, and to operate our plans. So, what I propose to help us to understand virtual processes, is that there is another layer of three (triadic) stages as in Figure 4. Not all of you will have understood exactly what physicists mean by field theory, but what I want to demonstrate is that, by looking at these triadic groups and postulating another prior group, we get some ideas which help us to understand quantum physics. This prior layer describes virtual processes, or potential energies, and the bottom layer is what I had to start with, which deals with the energy, the tendencies and the actual events. The point is that this new layer contains its own autonomous degree of processes, in which virtual events are produced by virtual quantum fields, starting off by what in physics is called the ‘field Lagrangian’. We don’t really know where the Lagrangian comes from, so again we have the same problem, but at least we can see that the virtual processes help prepare the kinetic and potential energies, and hence help prepare the tendencies. Note that there are virtual processes appearing even if there is nothing actually happening. Even if you take the space in this room between atoms, there are still virtual processes going on. The physicists say that there is ‘zero point energy’, and that there is a ‘physical vacuum’ which consists of fluctuations of the zero-point energy. What they imply is that there are virtual fields even though there might not be particle fields, and that these virtual fields produce measurable effects. I want now to identify these two layers with the ‘air’ layer and the ‘middle ether’ layer of Swedenborg (LJP 320) as shown in the figure, because his middle ether is the one he said was associated with the planets and their magnetism. He knew about magnetism, and he knew about planets. The main function of virtual events is the production of electrostatic attraction & repulsion, and magnetic forces, between charged particles. We now know that magnetism does not exist by itself, and is always combined with electrostatics: we talk of electro-magnetism. So we reinterpret Swedenborg’s ‘magnetism’ as that with which we know it is unified, namely electromagnetism. This looks like the middle ether. It is in the correct order, and has the correct internal structure, from Swedenborg’s point of view. We have the same pattern: a principle going to causes and then to effects. We do not know where the principle comes from, but we can see that it is a principle. This is the principle that physicists have used until recently as the initial point to describe quantum field theory. They start by writing down the Lagrangian, and look at all the terms in the Lagrangian, to work out all the possible virtual processes. They work out one-step and two-step processes for these virtual events, using for example perturbation theory. Then they work out the potential and kinetic energies, and carry on with the Hamiltonian and wave functions etc. This is all just describing in a simple way what physicists do these days. A picture of this (without the words ‘middle ether’ or ‘air’, of course) would be agreeable to my colleagues at work (I have tried it out on them13), so it is sensible from the physics point of view. The only thing that they find a little bit odd is that there is this strict order. There is no sort of give and take, no reciprocal interactions: I have always drawn the arrows ‘producing’ like to the right or down, so the whole business is that of influx: conditional influx. What you need to receive influx is something I don’t have time to talk about: that is really another talk14. At least from Swedenborg we know that there is such an order. We have a middle ether, and we have air, so what about gravity? That is the thing that is missing there. Let’s summarise what we know about gravity, very briefly. The best theory of gravity is Einstein’s General Theory of Relativity. It is still the best theory: no-one has disproved it. Physicists are not happy with it, for reasons which I will explain, but it is still the best theory. In this theory, space and time are ‘curved’ by gravity, according to the distribution of matter. I am not going to write down Einstein’s equations, but his basic idea is that the curvature of spacetime is due to the mass and energy in spacetime. There is no mention of probabilities, so it is again a classical theory. The result of this is that questions of quantum gravity are hotly discussed: the question of how to combine probabilities with the idea of curved spacetime. There have been frequent discussions of how we could possibly have in quantum gravity such a combination. For example, if space and time are somehow probabilistically generated, then how do you talk about probabilities, if we don’t have a distribution of space in which to have probabilities? There must be ‘alternatives’ of some kind! I hope that if we have insight into these problems of quantum gravity from Swedenborg, then we will be able to cast some light on these fundamental problems. According to Swedenborg, if we are in the spiritual world, we know that the space and time in the spiritual world are very flexible, let’s put it that way. Space depends on our mental state and our spiritual state. We know that if two people’s loves are similar, then they are close together in the spiritual world. We know that the Sun, the state of the Lord in the heavens, is so different from the state of angels that it appears at an enormous distance from them, shining on them. We also know that time is very flexible in the spiritual world. It seems to be a rule that, if someone asks you to do something, and you say that you are going to do it immediately but you want to do lots of other things beforehand, you always have ‘time’ for a diversion to do whatever else you wanted to do, and then come back to what the person asked you to do. There is no clock time in the spiritual world: there is only a succession of states. You can always have many successions of states of one kind between successive states of something else, and there is not the same rate of succession in different parts. Again, we see that space and time vary according to loves. Now I am going to present some ideas which are not really a theory, but an attempt at a unified view of what is going on, so we can begin to see correspondences. According to Swedenborg, loves dynamically generate the geometry of space and time that we have in the spiritual world (DLW 7, TCR 29). But we know that loves correspond to energies, so let’s take this sentence and translate it by correspondences into physics. We end up with the statement, that the energies dynamically generate the geometry of space and time in the physical world. This is exactly what General Relativity says. We don’t really understand the connections between loves and energies, or how exactly this works, but we can see the beginnings of some ideas which may in the future generate some insights. This suggests that our layers of air and middle ether need to be extended to include what I call a prior ‘formative’ degree. This is very speculative: I am using ideas of correspondences from Swedenborg to fill in the gaps. The nine layers which I have shaded in Figure 5 are composed first of the bottom six which I have talked about before: actual selections, propensity fields and energy; then above these: virtual events, virtual fields and the Lagrangian (whatever that is!). Then, I am saying, we would expect some layer above these, so this whole new layer acts as the principle in a triad of principle > cause > effect in the vertical direction. Since everything comes in triads, we cannot have just six: we have to have nine (a power of three). So it seems that there must be some general principle at the beginning, then some formative fields in the top middle, and the effect of these formative fields must be to generate spacetime. There must, at the top, be this new prior layer which is to do with gravity. We don’t really know anything about this, and, in fact, if all the physicists we know are thinking about quantum gravity could think of something useful, then we might have something to say. Conversely, if from Swedenborg we understood our correspondences perfectly well, we also might have something to say. The challenge is to get our ideas from different sources to meet together: we are trying to connect heaven and earth here, to see how they join up. The novelty is that this new prior layer is just like what Swedenborg said is the first ether, which is associated with gravity. It looks like here we have a first ether, a middle ether and air: this seems to make sense as long as we allow ourselves to interpret Swedenborg. Swedenborg was trying to tell what he knew to be true in the words which he had available to him. He had to use the words that were there; he could suggest things, but there were many things that he didn’t know. There are many things which he didn’t know but which we now know to be important, such as oxygen in air, so we have to work out exactly what these things are that he didn’t tell us. In this example we have applied the general principles extracted from Swedenborg’s ideas to reinterpret the details of his references to nature. We see, for example, the same general pattern vertically and horizontally. In the vertical direction, we see principle, cause and effect, or love, wisdom and use, or intention, understanding and effect, whichever correspondence we choose. And then there is the same pattern in each horizontal direction 1>3, 4>6 and 7>9. The overall influx must come in the sequence 1>9: this must be the way that the world is produced. These levels are all in the natural, and are not composed of anything mental. These are discrete degrees, all in the natural. We can explain how there can be partial views. The last triad is energy > wave > event, which corresponds to will, thought and action, but is not identical with it. But many people see these correspondences, and feel these correspondences, so much that many of them have been built into the language of today. Insight, warmth, etc are words which are used often. The role of energy in the body corresponds to the role of love in the spirit. We can call it heat, or generative energy, but whatever it is, it is something at the beginning which corresponds to the love side. The role of waves in the world corresponds to wisdom in the spirit. Waves in the world can be light waves, and we say that wisdom corresponds to light. The role of action events corresponds to decisions in the spirit, which are the effects at the end of the physical. Quantum physics is still not sure about these effects, as I said at the beginning, so there is still some unfinished business in physics concerning what these effects are and what actually produces them. People often conflate the energy in the body with the love in the spirit by saying that there are spiritual energies in us, and talk about auras as waves which they can see around people. Maybe they can, but these are not waves in the normal physical sense. Furthermore, many of those people I mentioned earlier who were trying to understand quantum physics built on the fact that there is a correspondence between physical events and spiritual decisions, by speculating that spiritual events were actual decisions. Some of that is true, since they seem to correspond, and so therefore we would expect a causal relation, because the correspondences come about from causal influx. I have said that physics consists of effects that are from forces and fields and then energy, and some people have thought from this that since energy was so different from matter in the physical world, perhaps energy must be the long-sought ‘spirit’. However, it only tells us something that corresponds to spirit. Other people have seen this final layer of energy, propensities and events, and have looked back to the virtual processes. They see that these virtual processes are here even if nothing is actually happening, and thus speculate that maybe it is these virtual processes which correspond to spirit, or are spirit. So we even get papers “Are Virtual Photons the Elementary Carriers of Consciousness”. I use these proposals to show the kinds of partial views, or conflation of correspondences that often occur. I have to read to you the second to last sentence “Due to the omnipresence of virtual photons, it follows finally that the whole universe must be embued with subjectivity”. This is what happens if you do not distinguish one prior degree in the natural from the real prior degrees which are in the spiritual. They correspond to each other, but they are not equal. My whole talk is about quantum physics and spirituality: there is a correspondence between them, but they are not equal. I will now discuss a few consequences from the ideas above. Consider the idea that physical actual selections are important, being the final result or the ‘bottom line’. The whole spiritual world produces the external spiritual world, and then all these degrees in the natural, and the last thing that it produces are the actual selections of one particular outcome in place of another. That is what quantum physics does not properly understand, but we know that it must be there. We know that the final or ultimate acts of the spirit are in the sensual mind. That what Swedenborg tells us (NJHD 50, AE 543), while psychologists would say that is the sensori-motor mind, which is slightly more accurate because it is the actions, not only the sensations, which are significant. And we know, from what I have just described, that the final acts in the world are these actual events: the selection of one particular outcome as distinct from another. Thus, these two things – the sensori-motor mind and the actual events – appear to correspond to each other. Thus Heisenberg, Wigner, Stapp and others, even Paul Davies, think that there is some connection between observers and the selection of actual events. We now see that they correspond to each other, and one of them must cause the other. There is something about the sensori-motor mind, the outermost layer of the external mind, according to which its operations must in some way be connected to the selection of a particular physical outcome. This explains in part how the natural world terminates the spiritual world. It is in the natural world that we really build up a fixed foundation, because these actual events which are the bottom line, are the definite choices for one way or the other. Swedenborg says that the natural world terminates and contains: that it is a containant for spiritual life and action (DLW 221). The loves which remain with us must be the loves which produce the actual events in our lives. This is essentially what Swedenborg is telling us (HH 480). This is all part of a greater story, of course: basically we know that there is an interior mind, an exterior mind, and the natural world16. What I have been talking about are the nine degrees in the natural world shown in the rightmost column of Figure 6. In this column, we have nature, in the middle column we have mind, in which we have the sensual (or sensorimotor) mind, an external rational (or scientific), and an internal rational which is produced after reformation. On the left, we have the same pattern again, in the heavens. These are the spiritual heavens. All of the talk so far has just been describing the nine degrees (an ennead) within the natural world, and of course the whole scheme is again an ennead (a nine-fold set). Swedenborg goes into great detail about what happens within the internal rational (AC 2657), and the lengthy process portrayed in Genesis is the progression from Abraham up to Joseph and beyond, which tells us the details of regenerating the internal rational. Figure 6: The Spiritual and Mental degrees in relation to the Natural. We do not yet know the details of the degrees 1,2 and 3 that form what Swedenborg calls the ‘Universal Ether’ (LJP 320). Such a table of these discrete degrees does not really explain the causes and their reasons, but provides a general classification. This classification allows us to make sense when quantum physics tells us that the things in the world are spread out fields which act in a unified way to give one actual outcome. It because that is the way we are. When humans think, we have an intention which thinks about many different possibilities, and then acts on one of them. That is what life is, and what we are seeing is that physical nature is no different. It is not conscious of itself in the same way, but it contains the same kinds of processes, the same functions. There is a similarity of functions, and this helps us to understand quantum physics. The natural corresponds to the physical, and we see how these degrees are all joined together. So, in conclusion, we see that there is a thorough correspondence (a correspondence in detail as well as the overall structure) between the functions in quantum nature, and the functions in the internal and external mind. There is not an equality of substance, but the functional patterns in nature are the same as the functional patterns in the internal mind, and again as the same as the functional patterns in the external mind. Therefore, if we put all these pictures together, we learn more about nature, as well as learning more about spirit17. Therefore, I hope, we get a better picture of each, as well as of the relation between them. 1 See Bryce S DeWitt, R Neill Graham eds The many-worlds Interpretation of Quantum Mechanics, Princeton University Press, 1973. 2 E. Wigner, ‘Remarks on the Mind-Body Question’, pp. 284 - 302 in The Scientist Speculates, I.J. Good (ed) Basic Books, N.Y., 1962. 4 S. Malin, Nature Loves to Hide, Oxford, 2001. 5 C.J.S. Clarke, Reality Through the Looking Glass. Floris, 1995. 6 E.H. Walker, The Physics of Consciousness: The Quantum Mind and the Meaning of Life, Perseus, 2000. 7 In the last two decades, physics has explored the possibility of strings or branes in place of particles. These extensions to one or two dimensional objects do not solve the selection problem. 8 James Jeans, The Mysterious Universe, Macmillan, 1930. 12 I have heard about the possible replacement of the word ‘ether’ by ‘vacuum’, but that would make a nonsense of this paragraph. If you replace the appearances of ‘ether’ here by the word ‘vacuum’, you get something very strange.